For any American household, their home mortgage is their largest debt and monthly expense. Often times when the main bread winner of the family dies or loses their job, they often cannot afford their mortgage. They either need to sell their home and move into a smaller home or often times become a renter. The story of the uncalled shooting and death of California Police Officer Ronil Singh touched many families. This tradedy hit many Americans in both party lines: Republicans and Democrats alike. Fox News is criticized and hated by many far left Democrats. However, the kindness of FOX NEWS To Pay Mortgage Balance To Family Of Slain Police Officer Ronil Singh has touched many Americans. Both Democrats and Republicans alike. America is a free country. Freedom of speech and the right to individual’s opinion is what makes the United States the greatest country in the world. Americans can choose to be Democrats, Republicans, Socialists, and/or Independents. There are folks who have developed a major hatred to Fox News. Many liberal media networks developed such hatred towards Fox News that the word Evil has a new definition in our vocabulary. Most Americans are good people. They have compassion and are often generous. The death of police officer Ronil Singh has touched many people’s lives, Americans in all party lines. Especially when officer Ronil Singh leaves a beautiful young son and wife. Their child will grow up never knowing his father. Mrs. Singh will be raising their first child all by herself. As homeowners, they will no doubt have financial difficulties on how to afford their mortgage payments. No doubt after the funeral of Officer Singh, the family needs to carefully go over their finances and see whether to sell their home and move in with either family and/or rent. Christmas is normally the best time for Americans and their families. Police Corporal Ronil Singh was shot and killed early December 26th, 2018 while on duty. The suspect was an illegal immigrant with gang affiliation and prior arrests according to Fox News. Corporal Ronil Singh is survived by his widow and five month old son. His widow Anamika Chand-Singh and 5 month old son can see the light at the end of the tunnel with at least the biggest monthly expense being out of the way. As I mentioned earlier in this article, every American is entitled to their political and religious views. However, all Americans should be concerned about the importance of border security and legal immigration. I am neither a Republican nor a Democrat. Both sides have their pros and cons that I agree and side with. However, border security and immigration is common sense for all Americans. Why is the government shutdown? Why can’t the Democrats agree on giving our President the funds required for the Wall for our borders. Democrats agreed on border security before. Why not now? Do they hate this President so much that they will risk the safety of our families and children? It just seems that Nancy Pelosi, Chuck Schumer, Elizabeth Warren, Kamala Harris, Adam Schiff are on a mission to destroy President Donald Trump and his Administration at all possible costs. Including the cost of our safety. 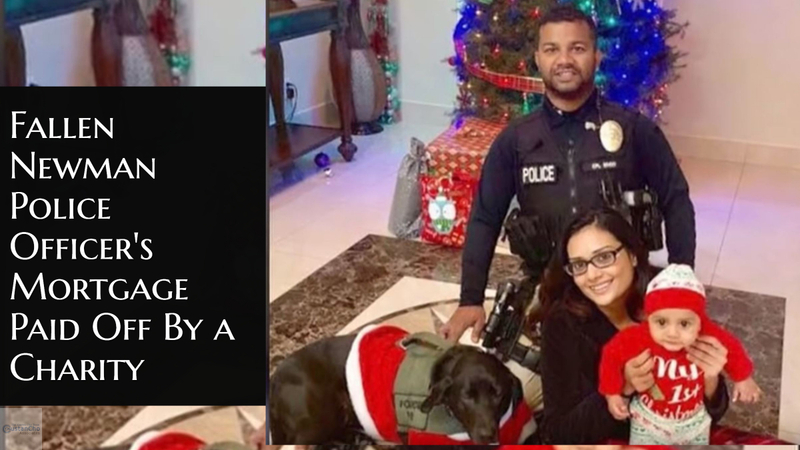 Could Officer Ronil Singh still be alive if we had border security? Why was the suspect in the United States with multiple prior DUI arrests and gang affiliation? Will Sanctuary Cities be the new NORM? Do we need more senseless deaths of our police officers due to the Democrats political game? How many more deaths will be necessary for Nancy Pelosi and Chuck Shumer and Team to realize that President Trump is right and the Democrats are wrong? The death of our heroes like Ronil Singh is what President Donald Trump is making such a deal for funding for our border walls. It is not a political game. Officer Singh himself was an immigrant from Fiji. However, he was a legal immigrant. He followed the rules and came to this Great Country legally. He accomplished the American Dream through legal channels. The United States of America is a nation of laws. We are a very generous nation. Not just the people but companies like FOX NEWS. FOX NEWS leadership made the dream come true for Mrs. Singh and her 5 month old son. FOX News made the raising of $350,000 to pay The Singh Family Mortgage Balance become a reality. Fox And Friends is FOX NEWS daily early morning show. Fox And Friends invited CEO Frank Siller to one of their early morning shows. Siller is the Chief Executive Officer of The Tunnel To Towers Foundation. Frank Siller was a guest on Fox And Friends. He was a guest on the show to announce this incredible news. The original amount targeted was $300,000. It surpassed the original amount by $50,000. The extra amount will be allocated for Singh’s 5 month old educational expenses. Mrs. Singh relayed the message to Siller to thank FOX News. Now the grieving widow does not have to worry about getting foreclosed or having any financial strain. To further the best news, their son will be taken care of for his future educational expenses. Its like Ronil Singh is watching over them from Heaven. This says a lot about FOX NEWS. What a great ending from one of America’s worst tragegies in history.